LEDs need a driver, and we have several DC/DC drivers to chose from. When combined with an AC/DC power supply, you can safely power multiple AcroStar or AcroStrip LEDs. 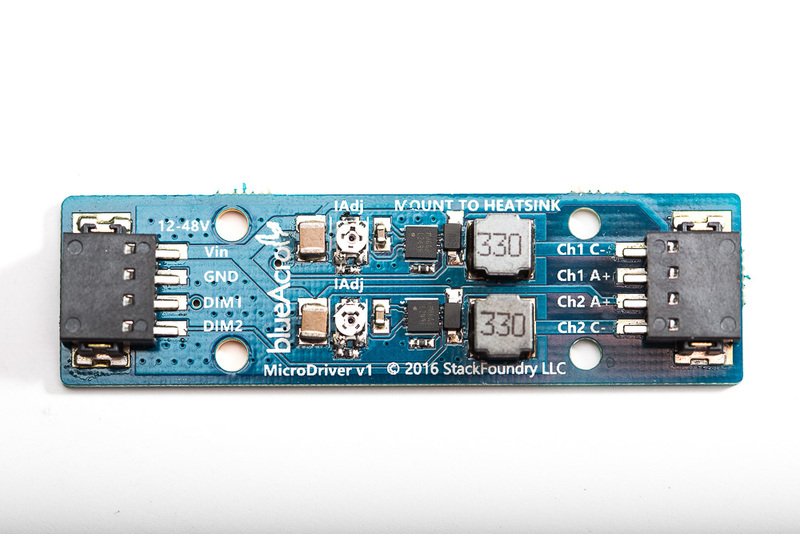 The AcroIQ MicroDriver driver is a mere 2.6 x 0.7 inches, offers two current adjustable channels with PWM dimming, and can mount right next to your LEDs on T-slot or other heatsinks. Capable of 48V supply voltages, the driver is fully compatible with any 3.3V or 5V PWM dimming signal from off-the-shelf controllers from blueAcro or others. New V2 design - same size, but more robust input protection and power filtering! PWM dimming is optional! The current is adjustable, between 400mA to 1000mA (1 Amp), using an on-board adjustment knob. The current limit works in tandem with PWM dimming! Need a power adapter? see our lineup including recommendations. One driver is capable of driving up to 3 Half-Mega AcroStars (when using a 48V power supply), and can be used as a pair to power 5 Mega4Z AcroStars. Up to 4 AcroStrip LEDs can be driven by a single driver. PWM dimmable over the entire range, including off, by a 120Hz-30kHz 3.3V-5V PWM signal. Push-in terminals accepting 20-26 gauge wire are provided for input power and LED connections.